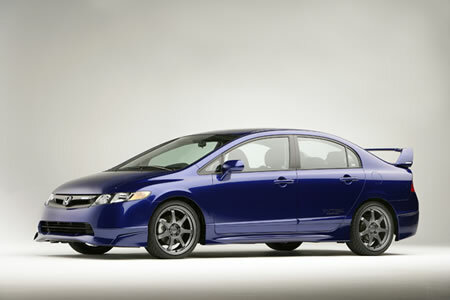 Honda revealed a prototype Civic MUGEN Si Sedan equipped with a high performance suspension, aerodynamic body styling and a sport exhaust system at the 2006 Specialty Equipment Market Association’s (SEMA) show in Las Vegas. The Honda Civic MUGEN Si Sedan draws inspiration from a “Formula Sport” concept, adding an aggressive dimension of performance to the Civic Si Sedan with a track-tuned suspension, aerodynamic body styling and a performance exhaust system. The track tuned suspension, tested at the Twin Ring Motegi racing circuit in Japan, lowers the vehicle by 0.6 inches (15mm) with highly aggressive spring and damper tuning for enhanced handling performance. The full-vehicle aero-package adds a front spoiler and sports grille, side spoilers, a rear diffuser and a rear wing. The lightweight MUGEN forged alloy wheels measure 18×7.5 inches and are shod with high grip 215/40R18 summer tires. The sports exhaust system reduces back pressure from the catalytic converter back resulting in an enhanced power curve. Additional accoutrements include front and rear MUGEN emblems along with a serial number placard on the instrument panel. A spherical 50 mm MUGEN aluminum shift knob replaces the standard aluminum and perforated leather shift knob. Planned for production in a limited quantity of 500 units a year, the Civic MUGEN Si will be available at U.S. Honda dealers starting in spring 2007 with a manufacturer’s suggested retail price (MSRP) of less than $30,000 and includes a full factory warranty.